The orientals say that good vibes bring prosperity, FENG SHUI TIPS to make our lives lucky; WHAT is FENG SHUI? How does it work? HOW TO “FENG SHUI" YOURSELF INTO WEALTH! I do believe that it’s true-- that HOME DECOR is useful for material growth. First time I read of the concept, nearly a decade ago, I brought in a big green plant from the garden, stuck it in the far left back corner of my house next to an East facing window. Within a day or two, a big Yoga Teacher called to tell me she was sending me the ROCK STAR as an astrology client. That rock star paid half my rent for 8 years! That’s worth the science experiment of putting a big plant in the corner. The magic art of Feng shui says that to be prosperous, hang wind chimes in every breeze. Do not block the room near any of the doors. Allow the ghosts to move, the chi energy to flow ---to move from DOOR to back of room. Create a corridor in the furniture. At the end of this corridor, a startling object of beauty at eye height. A mirror, a painting, framed by plants. They also say: Walk to the middle of your house.Face East. When that area of your house is clear so will your life be. What's in that area? Is it organized? Messy? Cluttered? East represents what's coming to you and where you're headed. South reps your career, so put a big plant there, green, alive and money will come. The West rules your mate/friends/open enemies. North rules your home life/emotional foundation so have lots of windows there, light pouring in. For each of the 8 corners of the room, pick a different thing to emphasize. On the left side is family. Children, Pictures of them. Far left back corner of the house is your prosperity center. Put a fire of some kind, a candle, jewels, paper money, prosperity gods, Elephants with upraised trunk. In the back right hand corner, put a big plant, that attracts money. You don’t have to get a book on this subject. 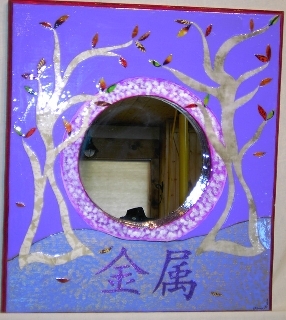 GO TO http://planetvermont.com/pvq/v8n4/feng-shui.html Or just page through one at the library or metaphysical book shop, each time you go. Pick up some tips and implement those tips, that week. What all this is about and nobody's saying is...make a dungeon and you'll attract ghosts; make a palace and you'll attract ANGELS. Work on the FENG SHUI of your home, regularly. Hit the poster shop. Find paintings of strong animals or beautiful nature scenes and get them up on the walls. It might be more powerful to PAINT them yourself. Paint yourself into the pictures. What you paint you become. If you can't do a portrait of yourself in your dream situation, in your castle, with your family, with your musical instrument or typewriter or whatever, give your chum brushes, stretched canvas (from a thirft store, overpaint it with zinc white,) and have pal do it.